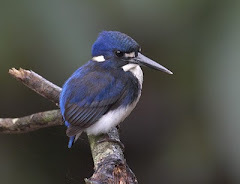 Lots of interesting things happening around Daintree at present for birdwatchers. Yesterday we took both a drive to the end of Stewart Creek Rd in the Daintree Valley, plus a walk along the first section with guests, and picked up a very handy list for our efforts. 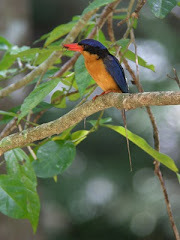 Birds included Buff-breasted Paradise Kingfisher, Barred Cuckoo-Shrike, Dollarbird, Channel-billed Cuckoo, Lovely Fairy-Wren, Red-backed Fairy-Wren, Golden-headed Cisticola, Little Eagle and Double-eyed Fig-Parrot excavating a nest. UK wildlife video-maker Malcolm Rymer is in the TNQ region for three weeks collecting footage for a 2 hour video on Birdwatching in Tropical North Queensland, which he will have available for sale at next year's British Birdfair. He is receiving excellent support from some local birding businesses and some very generous local birders and has collected some great footage thus far. His comments about the region are very encouraging, and it's great to be involved in a project which will potentially bring more people to the region for birdwatching. Thanks to those who have been involved, for being generous with their time and knowledge and also for their openness when dealing with Malcolm. While not daily, there have been sightings of Southern Cassowary north of the Daintree River. Four pairs of Papuan Frogmouth nesting on the Daintree River or creeks. Black Bitttern also seen. Lots of activity in the garden at Red Mill House with good flowers and fruit about. Wompoo Fruit-Dove and Double-eyed Fig-Parrot both favourites. This very handsome Brush Turkey seems to be holding sway over any intruders at present. It is also 'frog season' with many of the Giant White-lipped Green Tree Frogs taking refuge in the house each day, before making their way out at night to feed and frolic. This chap stopped over on a tripod on his way out last night. A pot-plant dweller during the day! And lastly, a sign-post 'pretend I'm not here' Graceful Tree-Frog. I'm surprised a Kookaburra didn't find him, but he survived the day.